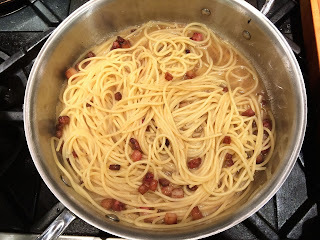 I've had more than several variations of spaghetti alla carbonara over the years but this version which I found in an Italian cookbook is by far my favorite. 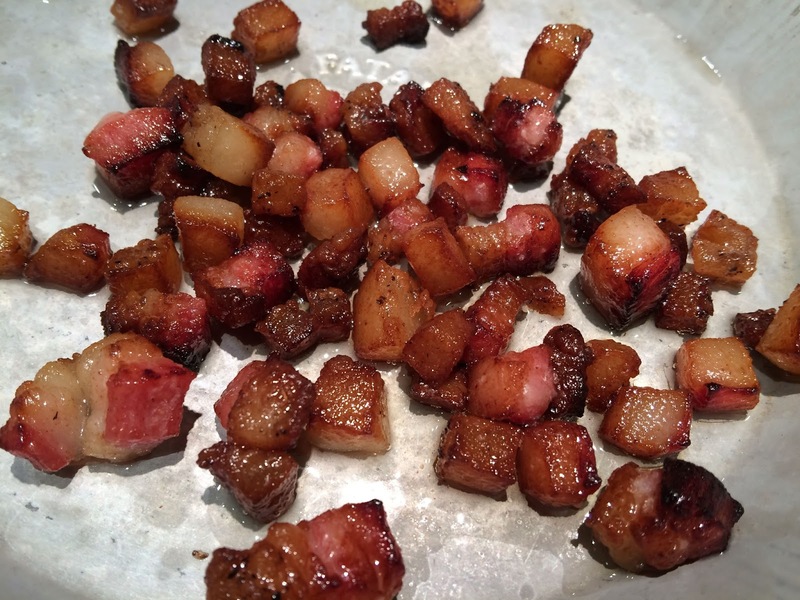 One of the reasons is that is uses guanciale rather than either pancetta or bacon for the meat which lends the dish, to my taste, a more authentic Italian quality. Guanciale can be hard to find here in the States but lucky for us there is a local butcher who makes a great one and always has it on hand. Regardless of the meat used, all of the good versions I've had or made is careful about adding the cooked meat and pasta into the eggs and cheese. 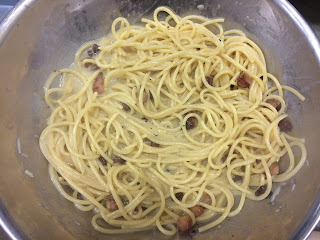 The heat of the meat and pasta is what cooks the egg giving the dish its creaminess with no actual cream ever added. A note about using guanciale: it is from the jowls of a pig and has more fat than meat from the belly. When using it keep an eye on it as it can be quick to burn. Pull it from the heat just when it starts to color and crisp up. A note about the cheese: any of Parmigiano-Reggiano, pecorino Romano, or Grana Padana is great for this dish but use the real deal and grate it yourself. 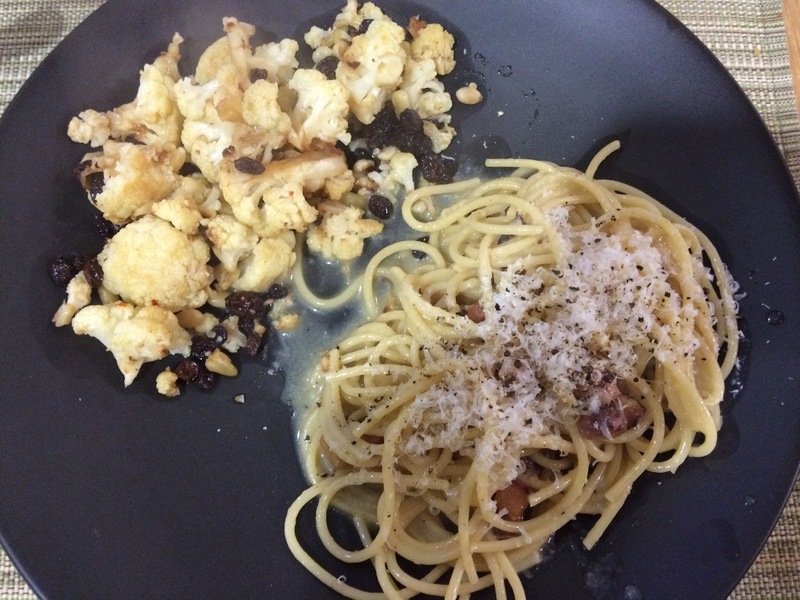 Don't use a pre-grated or boxed 'parmesan' - the flavor is not even close. Any of them can be expensive but a very little goes a long way and if you store it correctly can last quite a while in the frig. In a large pot, bring 4 quarts of salted water to a boil. Add the pasta to cook. While pasta is cooking, beat the eggs in a bowl then add the fresh grated cheese. In a skillet, heat the oil then add the guanciale cubes. Cook until colored and crisp then remove from heat. When the pasta is cooked, drain while reserving 1/2 cup of the pasta water. 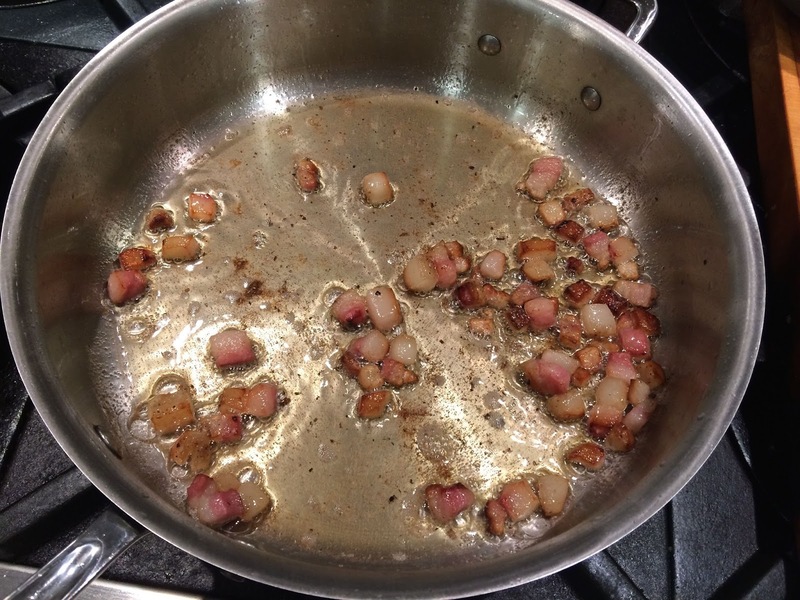 Bring the skillet with the guanciale back to a medium-low heat then add the drained pasta along with the pasta water to a simmer. 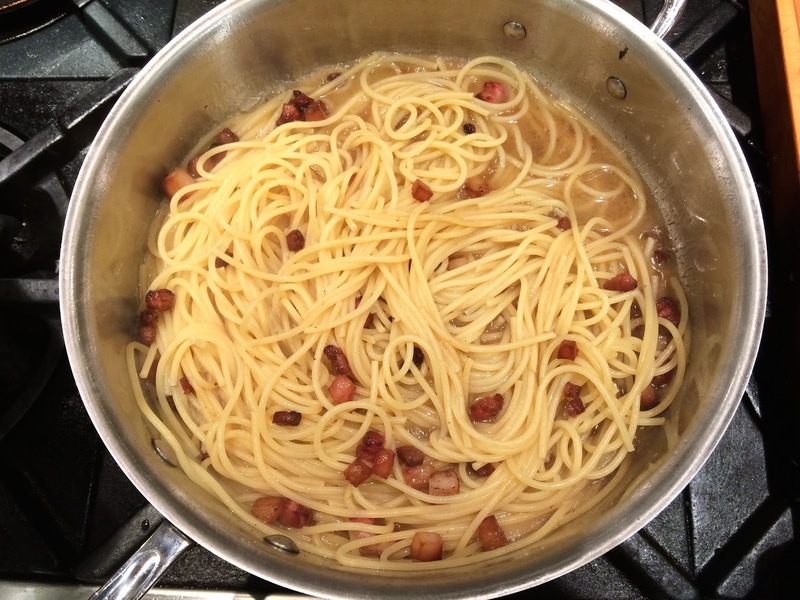 Let the pasta and meat cook until the water has been completely reduced. Remove the pan from the heat and empty the contents into a serving bowl. 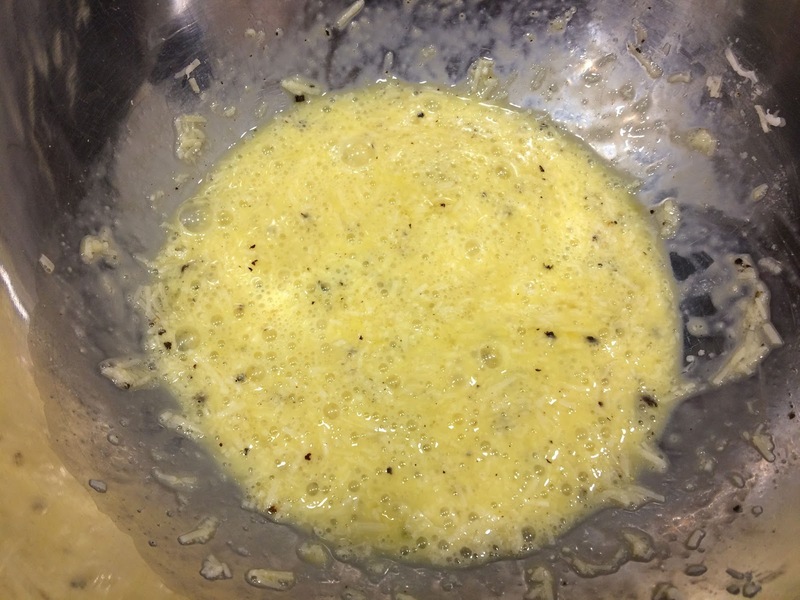 Add the egg-cheese mix into the bowl with the pasta and immediately stir quickly and thoroughly in order to prevent the egg from coagulating into scrambled eggs. Add plenty of black pepper, add salt if needed, and serve with cheese to be grated at the table as needed.